Since the modern series of Doctor Who started in 2005, there has been a Christmas Special every year. The first special, “The Christmas Invasion” was the introduction of David Tennant as the Tenth Doctor. This year’s “Twice Upon a Time” is Peter Capaldi’s last story as the Twelfth Doctor, as well as the final episode for show-runner Steven Moffat. When Doctor Who returns sometime next fall, Chris Chibnall will helm the show and Jodie Whittaker will be the Thirteenth Doctor. In a time travel twist, the Twelfth Doctor who is refusing to regenerate after the events of series 10’s finale, finds he is not alone in the South Pole. The First Doctor, portrayed by David Bradley and also refusing to regenerate, stumbles upon the Twelfth Doctor. The First Doctor doesn’t believe he’s with the Twelfth incarnation. Mysteriously time stops. Even the snowflakes are frozen. Interrupting the Doctor fest is a World War I captain who has been pulled from his timeline and dumped in the south pole. A glass figure soon approaches, disturbing the captain. The First Doctor invites him into the TARDIS and is surprised to find the Twelfth Doctor’s console room. Suddenly the TARDIS is rocked. There is a much larger ship above that has seized the capsule and begins lifting it into a grand chamber. On Sunday the BBC announced via its Social Media channels that the Thirteenth Doctor has her companions for Series 11. For the first time since the series revival, three companions were announced simultaneously. Yasmin (Mandip Gill), Graham (Bradley Walsh), The Doctor (Jodie Whittaker) and Ryan (Tosin Cole). There are still very few details known about Series 11, other than a new show-runner, Chris Chibnall and the first female Doctor, Jodie Whittaker, who will make her first appearance in this year’s Christmas Special. Mandip Gill graduated from university in 2009 with an acting degree. She’s a year or two younger than Jenna Coleman. She is best known for a three-year stint on the soap Hollyoaks, which she left in 2015. Interestingly, she’s guest starred on three separate medical dramas before being cast on Doctor Who. Bradley Walsh is a former footballer turned actor who had roles in soap Coronation Street and Law & Order: UK. He has also presented for ITV game shows. He is currently 57, which makes him one of the older actors cast for companion roles. Tosin Cole also starred on Hollyoaks, from 2010 to 2012, meaning his time on the show overlapped with Mandip Gill’s. Before that he was on an internet spin-off of the soap EastEnders. He also had a small role in Star Wars: The Force Awakens as an X-Wing pilot. In the BBC announcement the network also revealed that Doctor Who Series 11 will be a 10-week run of 50-minute episodes premiering in the Fall of 2018. Whether that means the end of August or 10 weeks before Christmas is unknown, but at least we have a general idea of an air date. With such a diverse TARDIS it’s hard not to get excited for Series 11! 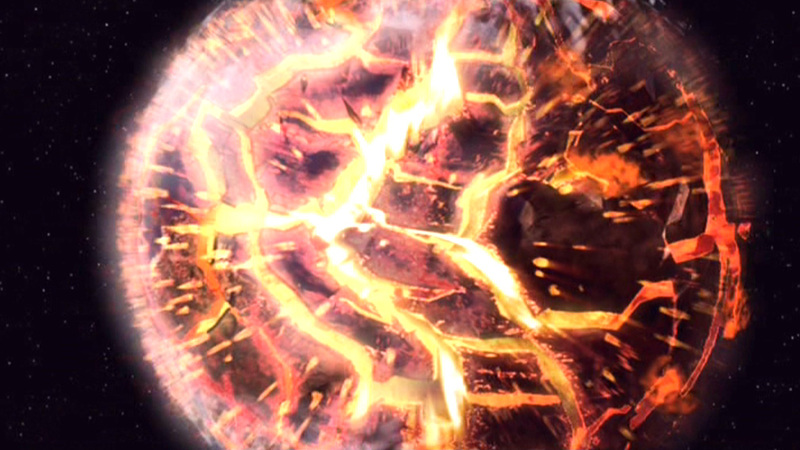 After the season-long arc of the Xindi attack in season 3 of Star Trek Enterprise, season 4 followed with several two and three-part stories. Thanks to a change in showrunner, season 4 saw more stories connected to TOS as a spiritual ancestor. One of the main threads of the final season was establishing long-term peaceful relations with not just the Vulcans, but Tellarites and Andorians as well. Together the four species founded the United Federation of Planets in 2161. For most of the franchise’s history Star Trek has used episodic storytelling. Especially in the Original Series and to a lesser extent, TNG, there were several stand-alone episodes where the character development did not carry over. But in the 90s, overarching stories were introduced, and Deep Space Nine used arcs in several of its seasons, especially with the Dominion War. 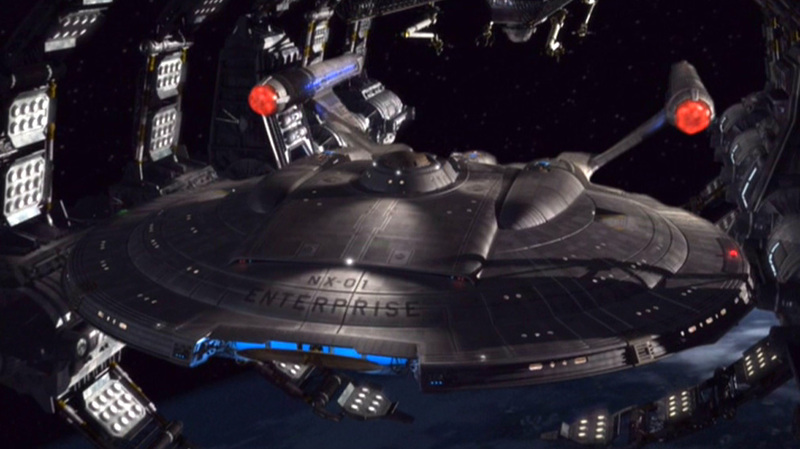 By the time Enterprise aired, the writers experimented with a season-long arc. The second season finale sets up an attack on Earth by an alien probe where seven million people are killed. The crew spend season 3 of Enterprise tracking down the Xindi to prevent another attack. Earth is destroyed in the pre-credits teaser. Near the end of the second season, the Enterprise crew discover a hypergiant star. 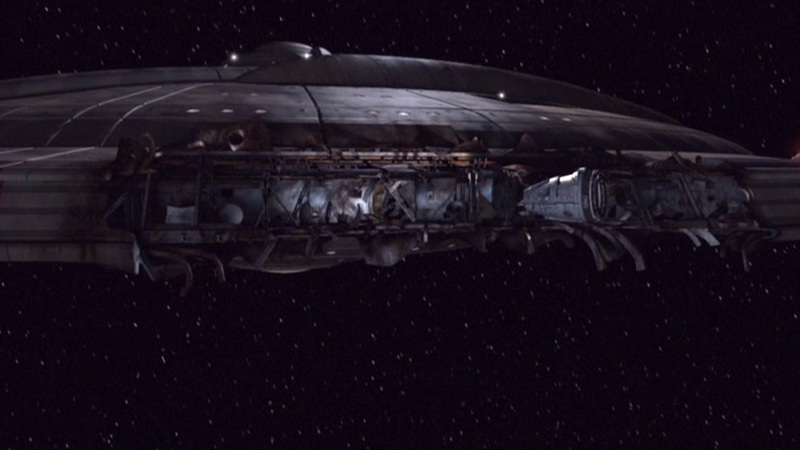 Thanks to primitive shielding, they can only investigate from a safe distance before the heat damages the ship. But they make first contact with an alien species who developed advanced technology and shielding to allow them to explore stars much closer. The Vissians are very friendly and Captain Archer invites them over to Enterprise for dinner and a cultural exchange. The Vissian captain dines with Archer, while the crew mingles with the rest of the Vissian delegation in the Mess Hall. Lieutenant Malcolm Reed meets the Vissian tactical officer and the two compare notes while flirting. Commander Trip Tucker introduces himself to the Vissian chief engineer who is there with his wife. The couple brought their ‘cogenitor’ with them because they want to have a child. Trip is intrigued, as he’s never encountered a species with a third gender before. He asks Doctor Phlox about it as he gets inoculated against omicron radiation. The Denobulan doctor doesn’t seem phased by the third gender. Trip introduces himself to the cogenitor. When we last left the NX-01 crew, they were beginning their mission of exploration. It’s remarkable how unprepared Captain Archer and his crew was by the 24th century standards viewers were accustomed to. But by the beginning of Season 2, the crew has bonded and the dynamic has improved. The previous episode saw the ship encounter a minefield with disastrous results. “Dead Stop” picks up with Archer and Tucker inspecting the damage in a pod. The ship is in such a way that it would take years to return to the Jupiter Station because the hull is so damaged they can’t go faster than Warp 2. Captain Archer decides he needs to send out a general distress call and asks Hoshi to be as vague as possible to hide how dire their situation is. The Alpha Quadrant is still uncharted territory in Archer’s time, and the captain is weary of encountering new species who may take advantage of them. A Tellarite freighter on the edge of communications range answers the distress call with coordinates of a repair station. Riding the high that the Star Trek franchise enjoyed during the mid 90s, a fourth spin-off to the original show was ordered. Brannon Braga and Rick Berman teamed up to create a prequel halfway between the 21st century seen in Star Trek: First Contact and the beginning of Kirk’s voyage seen in “Where No Man Has Gone Before.” After the Vulcans notice humanity’s first warp flight, they leave a delegation on Earth to guide humanity’s first steps into deep space. However, not everyone is a fan of the Vulcans, as some grumble the aliens are deliberately withholding information and keeping humanity back. The warp program was started by Zefram Cochrane to develop space vessels with faster-than-light engines. By 2151 they had a prototype vessel that had a Warp 5 engine. Earth is united and war, disease, and hunger are considered “wiped out” by some humans. Earth certainly looks far removed from the World War Three fallout we saw in First Contact. But the Vulcans still deem humanity unworthy for deep space travel because of their volatile nature. Everything changes when a Klingon crash lands in Oklahoma. Despite knowing very little about the species, Admiral Forrest decides to launch Enterprise ahead of schedule so they can return the Klingon to his home planet. Star Trek Voyager wrapped its seventh and final season in May of 2001. The third spin-off carried the franchise into the new millennium. It was the only Star Trek on the air for its last two seasons. The show had been airing concurrently with Deep Space Nine, but that incarnation of Star Trek was syndicated, while Voyager was United Paramount Network’s flagship show. Voyager finally makes it home in the series finale, but only because of a future incarnation of Captain Janeway who goes back in time to get the crew to the Alpha Quadrant. 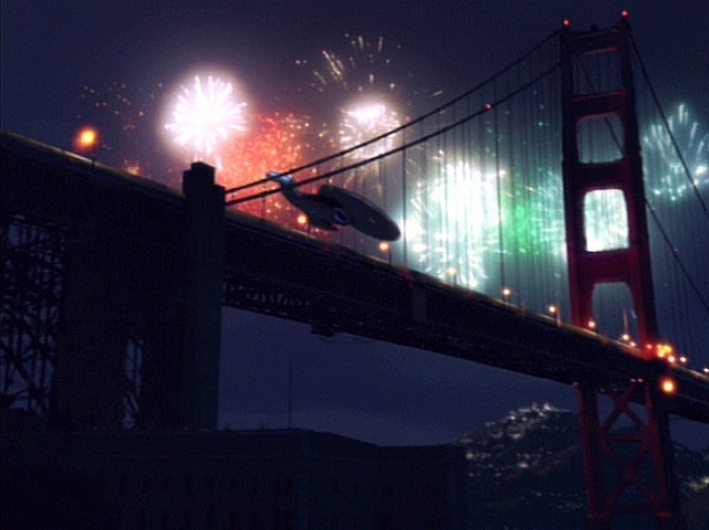 The episode opens with fireworks as Voyager flies over the Golden Gate Bridge. A newsreader’s voice-over reveals that it is the 10th anniversary of the ship’s return after their 23-year journey through the Delta Quadrant. Janeway ends the video and we see her older with silver hair. After the credits the crew gathers for a party and we see them 26 years older. Content Warning: “Extreme Risk” deals with depression, self-harm, and mentions suicide. “Extreme Risk” begins with B’Elanna Torres’ orbital skydiving on the holodeck. She pushes the shuttle even higher and disables the safety protocols, despite the warning of the computer. When she’s called to work, the chief engineer asks Seven of Nine to oversee the probe launch on her behalf. The liberated Borg drone, who joined the crew at the beginning of Season four, is surprised, as she and B’Elanna did not get along initially. It doesn’t take long for a Delta Quadrant alien to find Voyager’s probe. This time it’s the Malon, introduced during the premiere of Season five as a species with a garbage problem. Captain Janeway sends the probe to a gas giant to avoid recapture by the Malon, but it becomes stuck in the atmosphere and out of range of transporters. 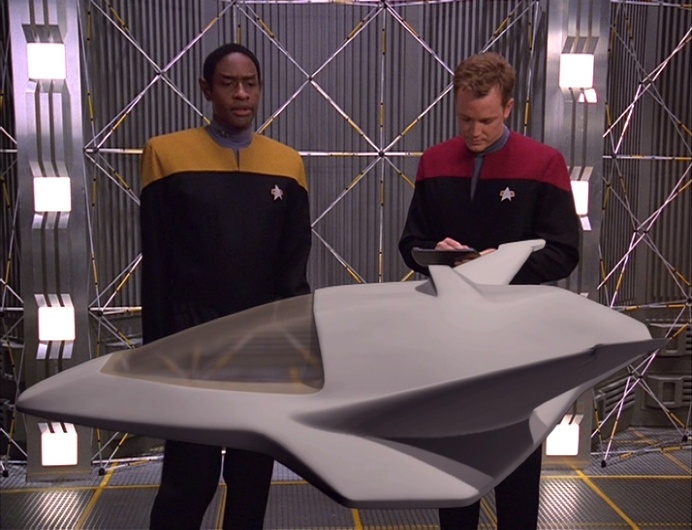 Tom Paris proposes they construct a new type of shuttle, one outfitted specifically for the Delta Quadrant. He calls it the Delta Flyer. The Captain is on board with the idea and wants it built in under a week.